Fairfax County high school students took turns wearing impairment goggles — designed to give them a real drunken experience, minus the alcohol — but it wasn't all fun and games. The high school students were wobbling, struggling to keep their balance and, in some cases, to push their wheelchair-bound friend down the hall without crashing. And they did it in front of a bunch of cops. 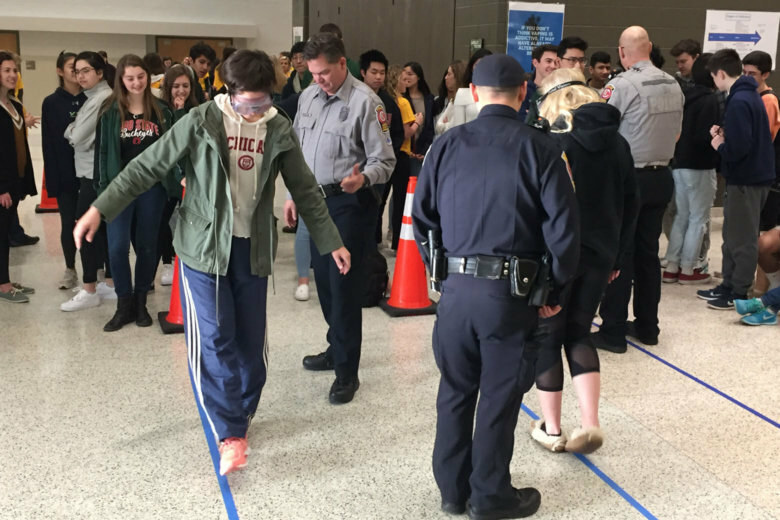 The students at Langley High School in Fairfax County, Virginia, were taking part in a biannual alcohol-awareness event hosted by the Police Department. The entire junior and senior classes took turns wearing impairment goggles specially designed to give them a real drunken experience, minus the alcohol. The police officers on hand then explained how a sobriety test would be conducted. “I probably already asked you to step out of the car,” explained the officer to one teen as he was about to put on the goggles. “I smelled the alcohol, your driving behavior [showed signs of impairment].” The next step is the walk-and-turn test, he said. The student, who already admitted he wasn’t the most coordinated kid, couldn’t get very far down the line taped on the ground. From there, students went into the auditorium and heard firsthand about the accidents that involved people their own age, whether it was someone drunk, or someone struck and killed because a driver was texting. And what students heard, and saw, inside the auditorium, was far different than the fun and games that were occurring just a few minutes before. It included interviews of a now-single dad who lost his wife and two kids to a teen drunk driver. Police also played the audio from the 911 dispatches from another crash that involved a texting driver who caused a crash that killed a Reston teen. “The stress it takes on a police officer as far as giving a death notification, it’s probably the most stressful thing a police officer has to do,” Beach told the students. The aim of the program, Shomaker said, is to couple the speeches and video featuring people who have suffered the consequences of impaired and distracted driving with the hands-on experiential learning. “It’s our belief that by marrying both of those together into one program, we are actually teaching better with this program than we would another way,” Shomaker said. Beach, the police officer, said the goal is to make an impact on students.